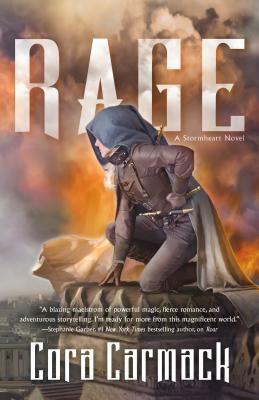 From New York Times bestselling author Cora Carmack, the second in the captivating new YA fantasy/romance Stormheart series, perfect for fans of Kristin Cashore and Victoria Aveyard. Her Kingdom or the Stormhunter she loves. If Aurora knows anything, it's that choices have consequences. To set things right, she joins a growing revolution on the streets of Pavan. In disguise as the rebel Roar, she puts her knowledge of the palace to use to aid the rebellion. But the Rage season is at its peak and not a day passes without the skies raining down destruction. Yet these storms are different…they churn with darkness, and attack with a will that’s desperate and violent. This feels like more than rage. Cora Carmack has done a multitude of things in her life–boring jobs (retail), fun jobs (theatre), stressful jobs (teaching), and dream jobs (writing). Raised in a small Texas town, she now lives in New York City and Texas, and spends her time writing, traveling, and marathoning various television shows on Netflix. Her first book, Losing It, was a New York Times and USA Today bestseller, and her subsequent books were also hits.